This summer, the girlfriend decided she was finally getting a dog. She has been wanting one for years now and our two boys are old enough now that they can help out. I tried to convince her that we really did not need a dog, and that instead we should have another baby. Somehow, the 39 weeks of pregnancy with all the throwing up and other personal discomforts did not appeal to her. 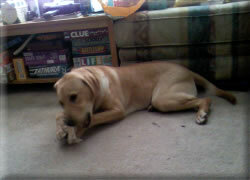 Sometime in June, she brought home a yellow lab puppy who I ended up naming Butters, after the South Park character. The name fits, cause Butters is not very smart, gets into trouble all the time, and is sometimes a pain. A dog can add stress to your life. A lot of people love dogs, I meet someone new every week just by walking Butters. Dogs love socks more than chasing rabbits. You have to teach puppies to lift their leg when they pee, this is something they have to be taught! Their sense of smell is their most important sense of all. They smell constantly. I’d have to say, that I’m surprised that Butters has not destroyed the house. My stereo equipment has been left untouched. Katryn has enforced a lot of rules on him and he has followed through on most of them. The hard part of course has been the constant training. I look forward to the day when I can let Butters in the living room and not have to worry about him getting in trouble.